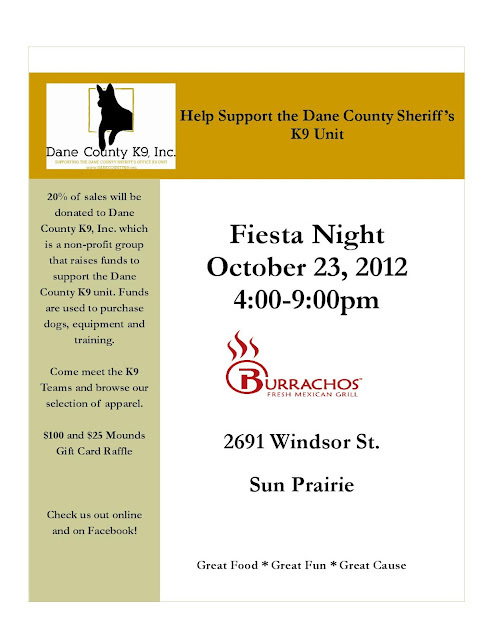 Burracho's benefit for Dane County K9's on October 23! Please join the Dane County Sheriff's K9 Unit and Dane County K9, Inc. for dinner at Burrachos Fresh Mexican Grill on Tuesday October 23rd, 2012. Eat a great meal while raising funds for Dane County K9, Inc., the non-profit organization suporting the Sheriff's Office K9 Unit. Meet the teams and browse the apparel. Infographic- Why Dogs are Epic! Many vets and pet owners are beginning to realize the benefits of feeding a raw, species-appropriate diet to their cats and dogs. One of the forerunners in offering a raw diet commercial is Stella & Chewy's, based out of Milwaukee, Wisconsin. Founder and President Marie Moody was kind enough to offer this exclusive interview with Mad About Pets and tell us about what makes her company stand out above the rest. (Mad About Pets) I understand that you are started Stella & Chewy's after your own dog Chewy was aided through illness by a raw diet. What are the benefits of a raw diet, and what types of common illnesses can it help prevent or treat? (Marie) We have heard from pet owners that while feeding Stella & Chewy’s their animals have a healthier appetite and better digestion, increased stamina and vitality, healthier coat and skin and less ear and eye issue. We’ve also gotten feedback that while on this diet the animals have fewer allergies and less obesity. The food increases not only the quality of life for the pet but also longevity. Stella & Chewy’s philosophy is based upon what pets naturally eat in the wild. Our frozen and freeze dried foods are made without using any heat. Foods that are processed above 120 degrees have less active enzymes and the vitamins and minerals are also impacted by heat. The food is therefore not as bioavailable. 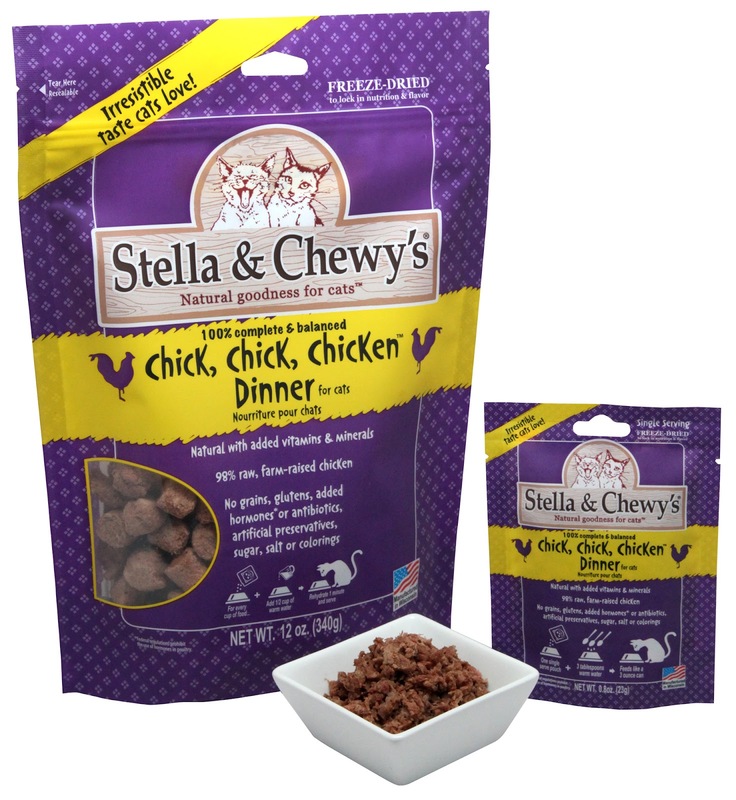 Stella & Chewy’s products are made without grains, fillers, artificial preservatives, added hormones or antibiotics. We don’t add sugar, salt or colorings. 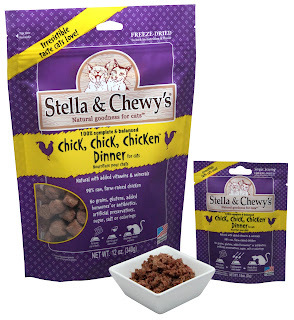 Stella & Chewy’s offers 100% complete and balanced dinners for dogs which are 95% raw meat, poultry and fish, 5% organic fruit and vegetables with added probiotics, vitamins and minerals. Many pet owners are leery of raw food diets because of the threat of foodborne illnesses. How does Stella & Chewy's ensure that their foods are safe? Stella & Chewy's offers both frozen and free dried raw diets for dogs. Is there a nutritional difference between frozen and freeze dried? What are the advantages of one over the other? When I took Chewy to the vet and found out how sick he was the vet recommended home prepared meals. I researched options and thought a raw diet made sense because it was species appropriate. It simulates how they eat in the wild and how their ancestors ate; no thumbs to make fires, no cooked foods. Foods cooked above a certain temperature lose much of their nutritional value and natural enzymes. Raw foods have natural enzymes, which are critical in building proteins and rebuilding the body. Both our freeze–dried and frozen products are raw and they do not differ nutritionally. The biggest difference is one is shelf stable and the other is frozen. The great thing about the freeze-dried is that it’s very convenient and easy to use. It’s a great option for a pet owner who’s either not familiar with or not committed to feeding a 100 % raw diet. The freeze-dried products enable him/ her to incorporate at least some raw into what is presently being feed. The freeze- dried is also extremely palatable, offers a long shelf life and is easy to travel with. I notice that for cats, Stella & Chewy's currently offers freeze dried diets only. Is there any plan to introduce frozen patties into the current feline line of products? At this point in time we are focused on the freeze-dried products for cats. What would you say the biggest difference is between Stella & Chewy's and other raw food diets currently available on the market? One big difference is that we have our own manufacturing plant in Milwaukee, WI. We have complete control over all aspects of the manufacturing and production of our products. We’ve implemented a safety process that ensures our products are free from harmful bacteria. We use only organic fruits and vegetable, cage-free poultry, wild- caught fish and naturally raised beef. Quite possibly the biggest difference between Stella & Chewy’s and other raw food diets is that we’ve made it very convenient to feed a raw diet. Does Stella & Chewy's have plans at this point to introduce any new flavors to the cat line? Stella & Chewy’s has recently introduced a new line of freeze-dried cat dinners in six varieties, all made from wild-caught fish and cage-free poultry. The dinners are available in Chick, Chick Chicken, Tummy Ticklin’ Turkey™, Duck, Duck Goose, Heavenly Herring & Tuna™, Sea-Licious Salmon & Cod™, and Yummy Lickin’ Salmon & Chicken™. The line includes the first-ever, single-serve dinners for cats, ideal for finicky eaters and to add mealtime variety. The single-serve pouches provide consumers ease-of-use and convenience – just add 3 tablespoons of warm water, mix & serve. Re-sealable 12 oz. bags provide customers the opportunity to purchase larger sizes once their pets establish favorites. If you could give readers one piece of advice when it comes to pet nutrition, what would it be? 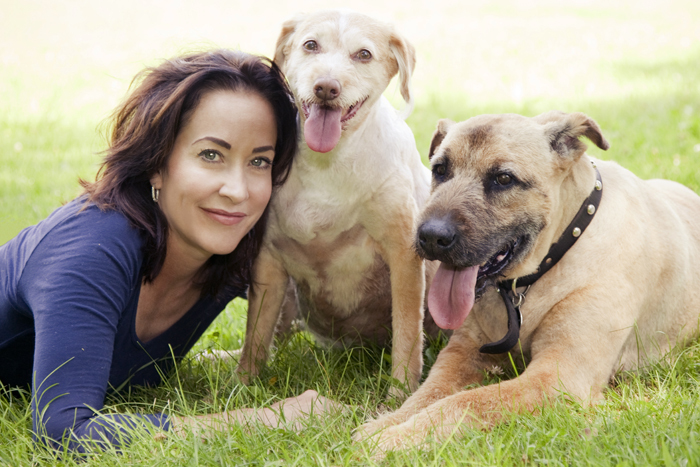 Good nutrition is the single most important factor in promoting longevity and quality of life for your pet. COMING SOON: Mad About Pets puts Stella & Chewy's to the test! Lots of people clicker train their dogs, but few people (even savvy cat owners) realize that clicker training a cat is not only possibly, but quite easy! The general opinion among the human population is that cats cannot be trained; they do things their own way, and that’s just the way it is. The truth is, cats can definitely be trained…it’s just a matter of finding what motivates them. Dogs are motivated by food but also by their need to be a member of the pack. In their minds, they are in constant danger of being designated the pariah of the pack so they try their hardest to please the other pack members (your family.) Cats, on the other hand, do not have a pack mentality. When it comes to cats, there is one surefire motivator: FOOD. The person in charge of the majority of cat care in your household should have a pretty good idea what food motivates your kitty most. Some cats might enjoy some little tidbits of meat or even a small amount of yogurt. Another easy training tool for cats are commercially available cat treats that come in 7 flavors. These are easy to keep in your pocket during a training session. Remember though: calories add up fast for a kitty, so always keep track of how many treats you give your cat during training, which is another important part of cat care! So why exactly would you want to clicker train your cat? Some people enjoy feline clicker training for the extra bonding time they get with their cats, and the mental challenge and stimulation it provides indoor cats. Cats can be taught useful behaviors like sit, stay, and even how to walk properly on a leash. Other people use clicker training to teach their cats “parlor tricks” like shake, play dead, or to walk on the hind legs. It’s best to start simple and play to the cat’s specific strengths. "Sit" is a simple and useful first behavior to start out with, and will give your cat a good idea of how the behavior/reward correlation works. For more advanced behaviors, it’s always easier to build on a behavior your cat already exhibits. If your cat likes to stand up on his hindquarters, teach him to do it on command. If your cat likes to roll onto her back, teach her to roll over on cue. Building on natural behaviors is a quick and easy way to add to your kitty’s training arsenal. 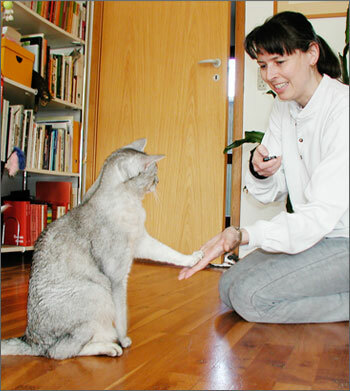 Clicker training principles for cats are essentially the same as they are for dogs. When a behavior is properly performed, the behavior must immediately be followed with a click of the clicker and a treat. It’s essential that the cat understands the correlation between the behavior and the food reward; if you’re too slow to the punch, your cat may not make the mental connection. It’s also crucial that the verbal and non-verbal cues you give your cat are consistent. If you use a verbal signal like “Sit!”, always use the same tone of voice, the same volume, and the same word every single time. For non-verbal cues like a hand signal, the same idea should be applied. The key to successful training is consistency and repetition. Though it may seem tedious at first, you will be so proud of your kitty cat when they master their first learned behavior!